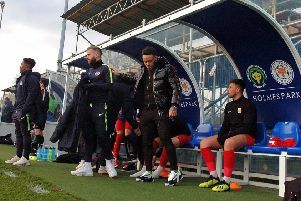 If it was Howell’s intention to throw their Senior Cup semi-final opponents off the scent on Saturday it certainly worked with an abject display at Borrowash in the East Midlands Counties League. A depleted squad brought first team debuts for Sean Warrilow and Joshua Blunt, while Michael Stevenson, nursing a hamstring injury was on the bench alongside Brad Smith, with Liam Chapman withdrawing in the pre-match warm-up. The first chance fell to Holwell as Mark Tinsley broke down the right and his low cross made it through to Warrilow, but keeper Dye did well to block his shot on the line. Holwell should have gone ahead on 16 minutes when Bitmead was felled in the box at a corner. But Foster put the penalty at a comfortable height for Dye who saved easily. Borrowash started to get their act together on a poor pitch and were ahead on 25 minutes. Holwell keeper Witham did not come out to Francis’ innocuous cross from the right which evaded Ridout, allowing Celson Patricino to head in. Witham redeemed himself when a ball over the top saw Patricino outstrip Bitmead and move in on goal, but Witham saved with his feet and Wells cleared. Holwell went on the attack with Hibbitt heading a corner agonisingly over the bar, but it was 2-0 after 34 minutes as Wells felled Patricino and Michael Fitzhugh slammed the penalty past Witham. Blunt and Warrilow were busy up front trying to make something work, while Tinsley made some good runs into space and Tom Harris sent in a few telling crosses. Holwell’s best move of the half came just before the break when Foster won the ball on the right and sent in a good cross to Tinsley who laid it off for Warrilow, but his shot was too high. The visitors started the second half on the front foot, but from then on it was a poor display with self-inflicted errors, while some showed a lack of fight and determination, pulling out of tackles and allowing the home side to dictate play. Patricino and Francis easily outpaced Holwell’s defenders as they latched onto balls over the top. Patricino hit the post and then left Bitmead and Wells for dead, but Witham did well to smother his shot. Holwell almost pulled one back when Dye turned away Hibbitt’s effort at the left-hand post. Stevenson came on for Harris, changing the system to 4-3-3, but just after the hour Borrowash sub Mlauzi broke the offside trap and centred to Fitzhugh for a tap-in. It was 4-0 just two minutes later when Markelic, who looked clearly offside, ran on to beat Witham. Holwell had capitulated now with Bitmead again outstripped by Mlauzi with 20 minutes left to put another nail in the coffin at 5-0. The visitors got a consolation on 76 minutes when Warrilow scored a debut goal. Holwell: Witham, Reeves, Ridout, Bitmead, Wells, Foster, Hibbitt, Blunt, Harris (Stevenson), Tinsley, Warrilow. Sub not used: B. Smith.